Do you remember the 2002 blockbuster movie Minority Report starring Tom Cruise? 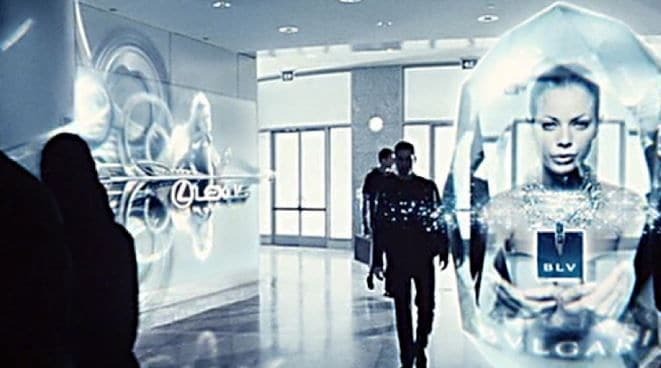 The movie Minority Report showed an extreme example of contextual marketing. While the movie is set in 2054, we do not have wait to see the marriage of technology and media. Of course, the technologies shown are not possible right now, the essence of this scene is already possible. It is using the convergence of technology and media to provide a context when marketing to consumers. Simply put, it is marketing the right thing, at the right time, to the right person. This is the Holy Grail of Marketing. Contextual marketing. It is worthy mentioning that Google is what it is today because of Adwords and Adsense, which was one of the early platforms to offer highly targeting contextual advertising. The advertisements themselves are served by automated systems where the advertisement has direct correlation with the content being viewed on the browser. Imagine that you’re browsing through a sports website for latest news on your favorite football club. Suddenly, you see an ad popup which displays club merchandise that you can buy. Wondering about a vacation in Europe? You might start seeing ads offering the cheapest flight tickets to France. You may have recognized this happening already in your daily life. Contextual marketing is a big wave in marketing on which you can surf. Here’s how. In this article, we will use the 5W1H approach, namely who, what, why, where, when and how. As we said earlier, contextual marketing is marketing the right thing, at the right time, to the right person. First we shall focus on the why. Then we will focus on finding the right people and where they are – the who and the where. Then we will move on to finding the right message and the right time- the what and when. Lastly, we will figure out how to deliver the message- the how. What Is Contextual Marketing & Why Is It Important? To see the difference between contextual marketing and traditional marketing, it’s important to understand how context causes this differentiation. It empowers the consumer instead of leaving it to the consumers to sift through the internet noise. You send precise, relevant and targeted information to consumers. 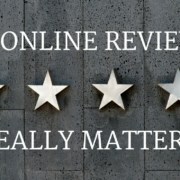 It also feeds the ever increasing need for instant gratification among consumers. You would be marketing stuff that they love. Before we dive into the nuts and bolts of contextual marketing, let us first understand what context is. 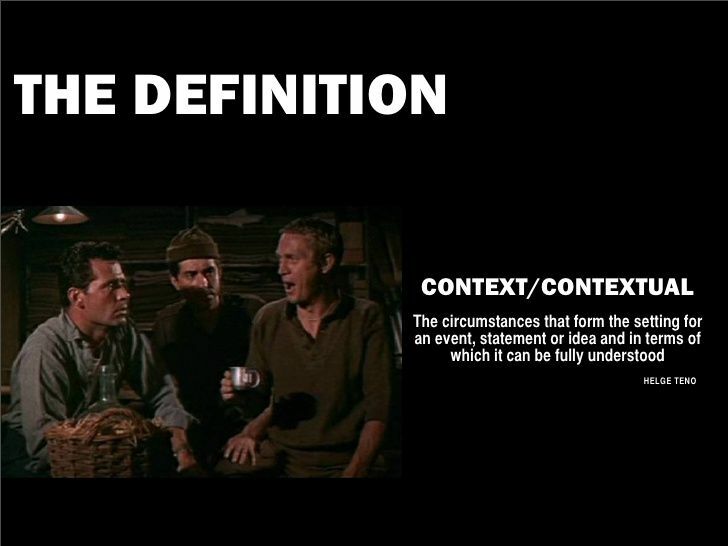 Definition of Context or Contextual quote by Helge Teno. Context always changes, more so in this world of ever increased connectivity and change. With the proliferation of smartphones, the factors which define context has increased. Especially in the context of marketing. The graphic above illustrates the wealth of data that can be harvested for contextual marketing. All of these elements are currently being used by big brands and corporations alike. Amazon has perfected the art of using the information it gathers about us to present information at just the moment we need it, and in a way that feels helpful but not obnoxious. A fun example of contextual marketing is the ad tweeted by Oreo during Super Bowl 2013. During the Super Bowl power outage in 2013, at 8:48pm, the company used Twitter to push out an ad which said, ‘You can still dunk in the dark.’ It was a smart, funny and an inexpensive move to link their brand to the awareness of the moment. 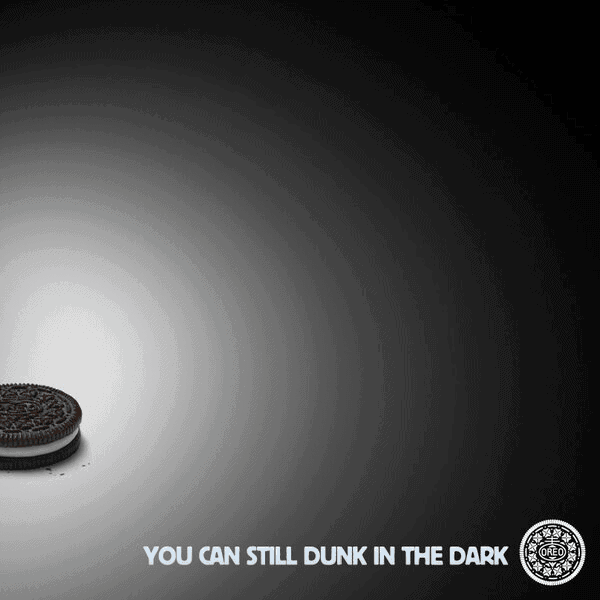 Instant contextual marketing from Oreos during a Superbowl blackout. Implementing contextual marketing requires you to embrace and adopt a fascinating intersection of data, automation, mobile devices and social media. Let us discuss these elements in detail one by one. While contextual marketing can be implemented in any platform, mobile deserves a special mention. The increased convergence of smartphones, apps and social media have led to the biggest explosion of data ever. The most important factor in mobile contextual marketing is found in the name: Location. According to a Pew REsearch Center survey, an overwhelming 74% of adult smartphone owners ages 18 and older say they use their phone to get directions or other information based on their current location. Over 50% of consumers are willing to share data to have a better shopping experience, according to a study by the e-tailing group. Combine location with past history and user profile and there is much data to be mined, harvested and used for marketing. Google coined a term in 2015 called micro moments to capture the impact of mobile on our search behaviors. Micro-moments are moments when consumers use their mobile devices to decide where to go, what to do, and what to buy. This nicely dovetails with the statistic that 68% of smartphone activity is conducted outside homes. In the mornings, we are in a rush to get to office and would like to enjoy a coffee before the commute. In the evening, we are more likely to want to have snacks. This would trigger a search for ‘Coffee near me’ in the morning and ‘Snacks near me’ in the evening. 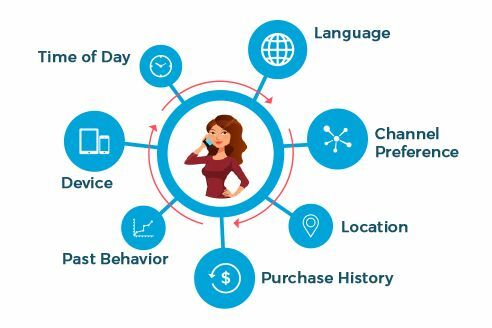 Based on these behavior-based contextual triggers, restaurants can cater to both the needs by customizing the suggestions for different times of the day for different people. In 2016, Bona Hardwood Floor Cleaner, a 90 year old consumer packaged goods brand, used predictive mobile advertising based on beacon data to target shoppers who were due for a shopping trip, as indicated by their weekly store visit habits. Using this data from a number of users, the brand was able to send them offers just before they were predicted to visit the store. The campaign achieved a ROI of 3.2x, with a 25.3% increase in post-engagement purchase intent and 55% increase in average brand awareness. Wouldn’t you like to have such numbers in your campaign report? Keep track of consumer’s micro moment activity and location. 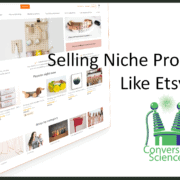 Customize your value proposition as per the time of the day and needs of the consumer. You can pause the campaign when consumers are not susceptible to suggestion. As location changes, so does the context. Most mobile apps have now a built in location feature. The key is to mobilise the ever changing location data to target (or not to target). Take the example of Google Now. Using data from search history and location, their app Google Now is a perfect example of targeted marketing. By recognizing repeated actions a user performs on the device like frequent locations, commutes, search queries and other information, Google Now is able to display more relevant information in the form of specialized cards. These cards cover a multitude of information like traffic and transit times, restaurant reservations, location reminders, nearby attraction, public transit and much more. Another example that comes to mind is the recent proliferation of apps designed for events. Tribeca Film Festival, New York’s annual film festival leveraged beacons to keep festival attendees up to date about event happenings, ticket sales and promotions. Deploying beacons around and inside the event venues, they were able to have a real time, data driven and targeted interaction with the people. App-holders who walked by bus shelters and out-of-home ads (equipped with beacons) with the app open on their device, received notifications alerting them that they could purchase tickets straight from the app. On the other hand, beacons at the venue were used to push contextual notifications such as the ones asking attendees for their feedback on a particular film when they exited the screening. In addition to that, the film festival also used beacons to offer merchandise discounts by deploying them at the ticket counters. Link real time location data and relevant information to serve the consumers. If you have an app for your brand, make sure your contextual marketing strategy is leveraging the real time data of consumers. You are able to offer more precise services to consumers. You can decrease consumer annoyance and fatigue. Precise and targeted services drive brand loyalty. All the automation and fancy software will not help you if you do not know your consumer. As explained earlier, people are willing to give you data if it helps improve their consumer experience. You get a wealth of data on your customers everyday, through your stores, newsletter signups, and loyalty cards. Leverage this by first consolidating and using all the information into a user profile. This can be combined with mobile app data to offer more targeted experience. Let’s say a consumer buys a pair of pants from your store. Based on their cart history and purchases, you can send an offer for shirts that will go well with the trousers via app push notification when they are in the vicinity of your store. Mobile apps can also be used for in store contextual marketing and personalization. This also leverages the who, the when and the where, all of the elements of mobile contextual marketing. While we have been harping annoyingly on data, there is one major issue we haven’t addressed. Several surveys have pointed out consumers’ willingness to share data for value. The key is providing value in return. People don’t mind sharing their data if it results in a better shopping experience. While the current consumer climate favors your efforts for contextual marketing, it is critical to maintain a balance between privacy and relevance. Make sure you own your data. Give no access to third parties. Be transparent with your consumers over data usage. And before we wind up this article, we would like to give you one last tip. Contextual marketing, while new in implementation and scope, is still marketing. And like all endeavours, it needs continuous improvement and learning. It is more of an iterative process that gets you closer and closer to your goal. So keep learning, keep growing, be helpful but not annoying. What has been your experience in contextual marketing? What has and has not worked for you? Share your thoughts so we can all learn from each other. 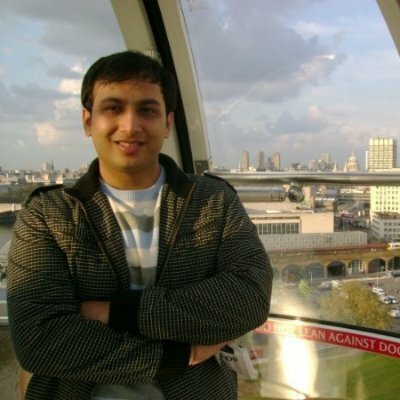 Vaibhav Kakkar is Co-Founder and Chief Growth Officer at RankWatch and NotifyFox, Software Solutions that help digital marketers perform better. Apart from helping businesses succeed online and writing about Internet Marketing, he spends time digging deep into the beautiful world of search engine algorithms. You can connect with him on LinkedIn.